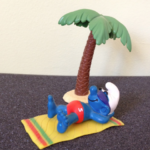 For many of us, Summer is the best time of year to take a relaxing holiday and the smurfs understood this with three Super Smurfs showing us how it can be done. 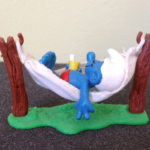 Smurf in Hammock #40226, Smurf on Holidays #40261 and Smurfette on Holidays #40262. For others a relaxing holiday may mean going on adventure but we can talk about those smurfs on another day. First released in the USA by Wallace Berrie in 1983, we find a smurf lying on a hammock held up by two wooden poles on a grass pattern base. This smurf is holding a yellow drink with a white straw, while wearing red bathers and has both eyes closed and a sheepish smile. 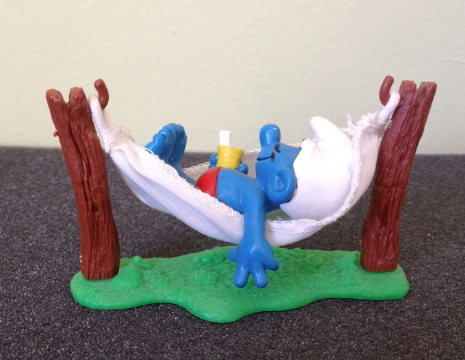 It wasn’t until 1985 that Schleich started selling Smurf in Hammock and then ended up selling it for the next 30 years until 2015. This would probably one of the longest selling Super Smurfs that Schleich ever sold. Very little changes were made over the years it was sold, though little differences can be found such as the yellow paint used on the drink, the length of the straw, the material used for the hammock. Possibly the biggest difference is that the German version is made out of blue pvc material and the Hong Kong version is made out of white pvc material. Smurf on Holidays was first released by Schleich in 2001 and was sold up until 2015. Lying under a palm tree, the smurf is wearing his sunglasses and his red bathers on a yellow beach towel with his arms behind his head. If you look close enough you will see a little ‘S’ on his bathers. Also on the yellow towel are two red and green stripes at both ends of the towel. In regards to the markings, the smurf’s are on his back, on the bottom of the palm tree and there are none on the towel. Also released in 2001 and sold until 2015 Smurfette on Holidays is a never smurf that on some days make you feel jealous. 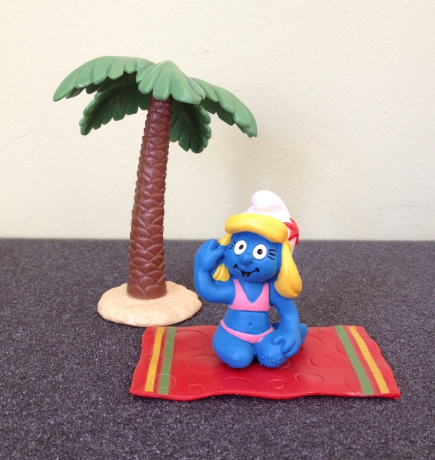 Smurfette can be found wearing pink bikinis and is sitting on her red beach towel under a palm tree. On her white hat is a red star fish and the towel has a green and yellow stripes at both ends. In regards to the markings, Smurfette’s markings can be found under her legs, on the bottom of the palm tree and there are none on the towel. This is a very cute Super Smurf! Back in 2001, blue paint dots were added for the first time to some smurfs to indicate a new pvc material was used in production. Around the same time, shiny blue paint was also used on some smurfs and Super Smurfs. So both Smurf on Holidays and Smurfette on Holidays can be found with a blue paint dot under their foot and painted in shiny blue paint. If you are lucky enough to buy these smurfs in their original boxes they should also display a blue dot.